Staff File Photo by Robin Rudd Walker County Commissioner Shannon Whitfield attended the grand opening of fire station. Walker County hosted an open house for its new fire station in Flintstone on July 14, 2017. An Aug. 8 letter from Erlanger Chief Legal Officer Jeffrey Woodard to Walker County Attorney Robin Rogers. UPDATE: Erlanger Health System spokeswoman Pat Charles said that the hospital does not agree with Walker County Commissioner Shannon Whitfield's assessment that he cannot commit the county to debt beyond the end of his term in 2020. "Mr. Whitfield's characterization of the discussion with Erlanger officials is inaccurate; this is clearly evidenced by the two options proposing repayment beyond his initial term of office," Charles wrote in an email. ORIGINAL STORY: LAFAYETTE, Ga. — Erlanger CEO Kevin Spiegel offered Walker County a deal that wouldn't have cost taxpayers so much this year. But Commissioner Shannon Whitfield turned down the hospital. Why? While more lenient, he said, the deal would have been illegal. On Aug. 8, according to a letter obtained through an open records request, Erlanger Chief Legal Officer Jeffrey Woodard told Walker County Attorney Robin Rogers the hospital would give the local government three options to pay back its debt. The first option required $8.7 million over three years. The second deal cost $9 million over six years. And the third option cost $9.4 million over seven years. While more expensive in the long run, the second and third options would require less money each year, putting a lighter burden on property owners every fall. Those deals, however, would have been commitments that stretched beyond Whitfield's term, which runs through 2020. According to Georgia law, a county commission cannot sign an agreement extending a debt for the next commission, with some loopholes. As a result, Whitfield is increasing property taxes this year by 50 or 70 percent, depending on where you live in Walker County. And at the same time, he still has not reached an agreement with Erlanger. "It's all just at a stalemate," he said Tuesday. 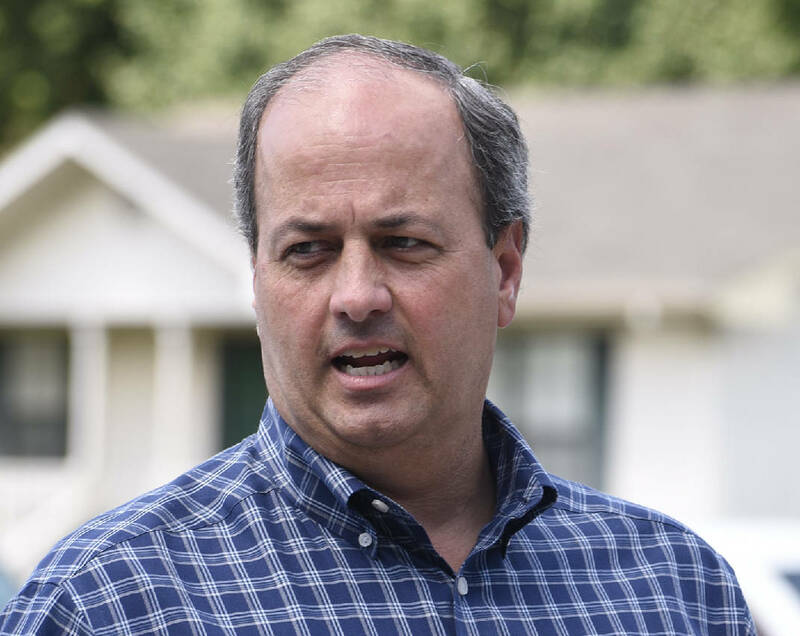 Whitfield has budgeted $2.5 million to pay Erlanger this year. That would be more than enough money for Erlanger's second and third proposed options. But it's not enough for the first option, the only one that Whitfield said is legal. "The letter speaks for itself," Erlanger spokeswoman Pat Charles said in an email Tuesday. "Currently no agreement is in place, and the three options outlined in the letter remain on the table." Whitfield's quagmire began when his predecessor, Bebe Heiskell, committed the county to a debt — a move that Whitfield said typically is illegal. Heiskell, however, was working through a loophole. In 2011, Erlanger and Hutcheson Medical Center entered into a management agreement, with Erlanger running the Fort Oglethorpe hospital's day-to-day operations. At the time, Hutcheson had lost about $24 million in 2009-10. As part of the deal, Erlanger loaned $20 million. And as part of that deal, Heiskell and the Catoosa County commissioners each promised Hutcheson's board that their local governments would cover half of Erlanger's loan, if necessary. In 2013, Hutcheson's board ended the agreement, and Erlanger's board began to pursue the money — a pursuit that stalled for a year when Hutcheson filed for bankruptcy in November 2014. At any rate, the agreement Heiskell signed puts the onus on Whitfield. But her agreement was legal because she committed to the debt through an intergovernmental agreement, one of those loopholes to the state's debt rules. Whitfield can't pursue the same path because intergovernmental agreements are valid only among Georgia government entities. Back in 2011, Walker County's agreement was with Catoosa County and Hutcheson's board. Whitfield would not be able to pursue such an agreement with Erlanger, if only because it's headquartered just across the state line. Charles did not respond to an email asking if Erlanger agreed that Whitfield could only commit payments through the end of 2020. In the meantime, Walker County property owners are footing a big bill. Whitfield has let them know he's over a barrel, with Spiegel performing the flogging. 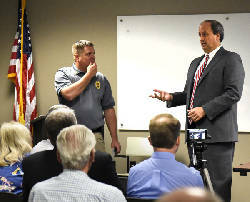 "Folks," Whitfield told a crowd at a public meeting Aug. 24, "I'm out of time. I'm out of resources. I'm out of money. We know of no other option of how to do this, to make this fair, equitable. To do what we can do." During an appearance on UCTV on Sept. 13, he said, "We keep hoping that we would have some type of resolution and get them to compromise and be compassionate with us and help us. So there's still time. And there's still hope that they'll do the right thing. That's all we're asking them to do, is just meet us part of the way." That same night, he said: "They're holding all the cards. They're in the strong position. They've got the big hammer. And they're in the driver's seat. They like to make that clear." In the meantime, Walker County and Erlanger are preparing to go to trial in U.S. District Court. Erlanger is pursuing $180,000 in attorney's fees — money they say they had to pay lawyers to try to force money out of the county. In August, Whitfield raised the county's portion on property taxes by about 22 percent, though the total varies depending on whether you live in an incorporated part of the county. But that only tells half the story. Whitfield also introduced a special property tax to pay off some of the Erlanger debt: charging 0.14 percent of your home's assessed value. He capped the annual tax at $1,000 — which you would not hit unless your property is worth at least $715,000. For everyone else, the added tax boosts the overall property tax increase to 52 percent for people in the incorporated part of the county. For those in the unincorporated parts, the overall tax increase this year is 70 percent.